I’m a bit late with my Great British Bake Off round up and bake as I have been at a wedding all weekend in St Ives – such a beautiful place! 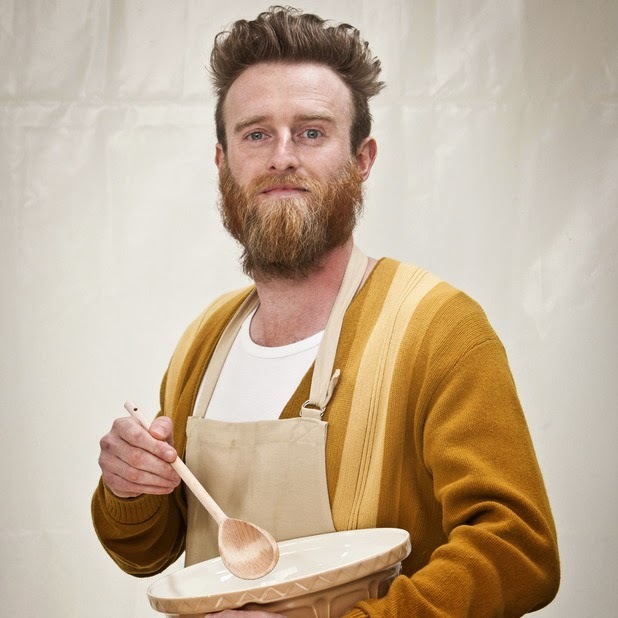 Last week was episode 4 of The Great British Bake Off and the baking category was ‘Desserts’. For the first signature challenge, the judges asked for 8 individually served ‘self saucing’ puddings. 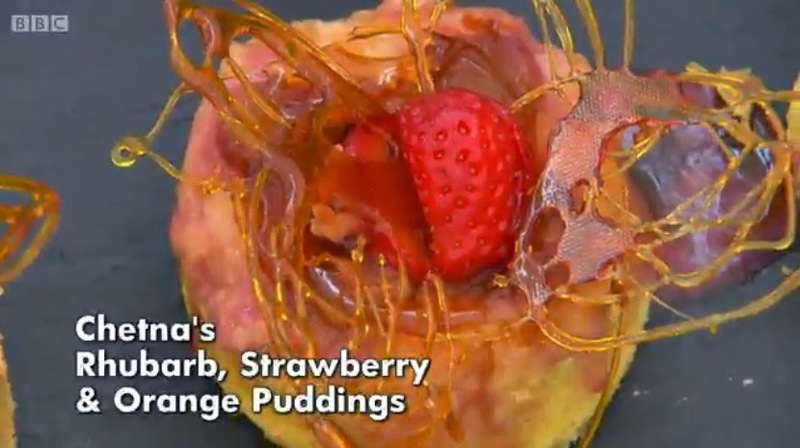 I’ve never heard of this before, however there are two main types of this pudding variant; melt in the middle fondants, and sponges that create a sauce underneath when baked. Only Chetna, Norman and Luis tried out the latter option. Either way, the idea is to have a sponge crust and an oozing sauce when the sponge is broken into. Sounds good! Chocolate and fruity flavours were popular throughout the tent. Chetna’s Rhubarb, Orange & Strawberry Puddings looked beautiful, but were not saucy enough for Paul and Mary. Nancy also suffered from a lack of sauce, whereas Luis’ sauce was too watery. Richard’s Black Forest Puddings were a big success, and Iain also did well. I think it is quite interesting to see how the older generation of bakers approach each challenge. Norman made a Sticky Toffee Pudding and Diana made classic Lemon Surprise Pudding. 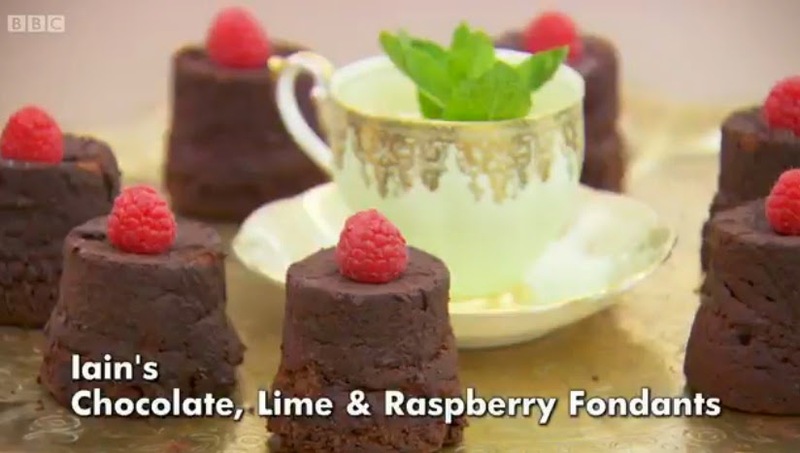 The judges enjoyed both of their creations and I think it’s nice to see some classics as it is what you would be more likely to bake at home, or at least to try out for the first time if giving self saucing puddings a go. 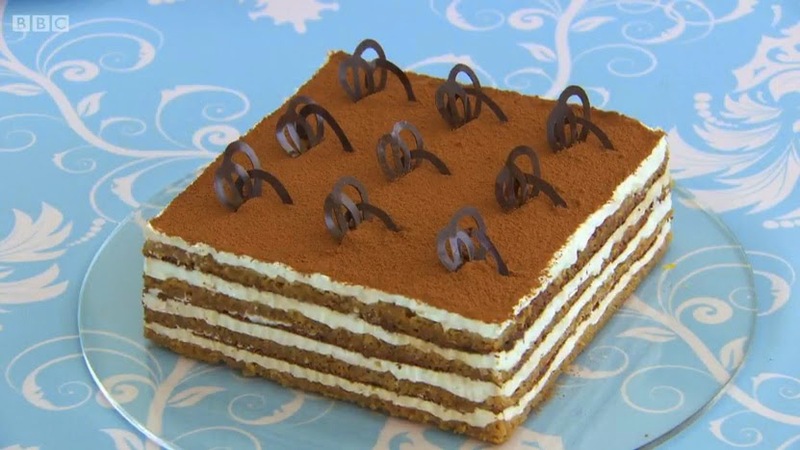 A layered Tiramasu Cake was this week’s technical challenge. Mary’s version looked extremely professional. Is it wrong that sometimes I wonder if her and Paul actually make the ‘example’ bakes for the technical challenge scene?! This dessert is all about precision, and getting the layers even and visible. The sponge had to be sliced horizontally to get the very thin layers, both Iain and Richard baked theirs again as it didnt rise enough the first time. Norman graced us with another classic quote “I’ve never made this before no. I couldn’t even spell it!” Martha was the only baker who had made this before and came first in the challenge, Luis came second and Chetna third. Diana took last place, with Norman and Kate in eighth and seventh places. 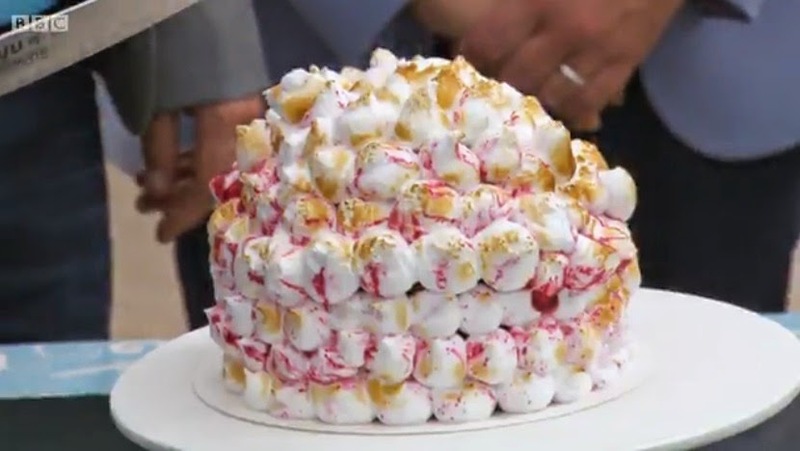 Seen as it was the hottest day of the year, the Baked Alaska showstopper is probably the worst timed challenge of the series! “What can possibly go wrong?” Luis stated at the start, oh Luis…! 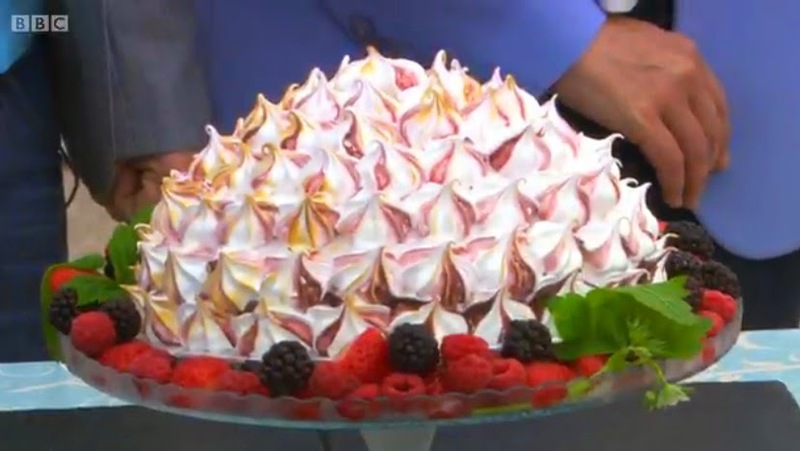 A Baked Alaska is a very retro dessert and contains ice cream. So the bakers spent the majority of their 4 and a half hour time limit flapping around the freezers waiting and praying for their ice cream to freeze. I don’t think the time is sufficient for it to freeze in, could they have not made it the day before and left it overnight? No matter how long it was out of the freezer for, in my opinion Diana’s behaviour was not in the spirit of the competition. Remember how awful Deborah felt when she accidentally stole Howard’s custard? She admitted her mistake and apologised, then when the trifles were judged by Paul and Mary it was taken into consideration. Diana didn’t apologise, and hasn’t that I am aware of in the media since (correct me if I’m wrong!) She shouted back that he should be using another freezer when Iain asked her why she had done it. She didn’t apologise, try to go after him, or emit any trace of regret. The Great British Bake Off contestants always have such a fantastic sense of camaraderie, they help each other out and are genuine friend. So it was very disappointing for me to see this kind of behaviour. Well this all culminated in Iain throwing his bake in the bin, and Paul and Mary decided to send him home. And the Great British people were not happy! Twitter completely erupted. (Have a read of this Buzzfeed article for some particularly outragous tweets.) The full events did not appear to have been explained to Paul and Mary. I think that no one should have left and two should have gone next week. There was a similar incident a couple of years ago when John cut his hand and couldn’t present his bake. 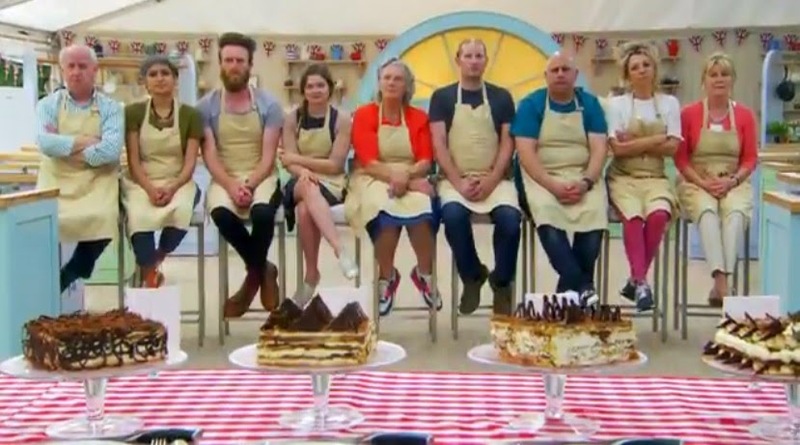 Definitely the most controversial Bake Off yet! Looking forward to seeing what next week’s pie week brings! I decided to try out an Orange Self Saucing Pudding this week. 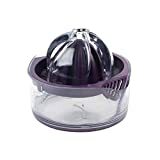 I have made Chocolate Fondants before a few times with success, so I did think about trying one of the other bakes, but I’m not a coffee fan at all and I don’t have an ice cream maker. So pudding it was! I started by greasing the ramekins. Don’t line them with paper as I have done above, I realised it was not necessary later on. Just grease with butter all over. Into a large bowl I sifted self raising flour, added golden caster sugar and orange zest. I mixed it with a wooden spoon. Using a fork I mixed up melted butter, egg and semi skimmed milk in a jug, added it to the dry ingredients and stirred together with a wooden spoon. I divided the mixture between the ramekins. In a separate bowl I mixed together sugar and cornflour. Sprinkle the sugar mixture over the batter, I used a heaped tablespoon and made sure to cover the batter fully. I juiced the oranges, if you don’t get enough you can add some fresh orange juice from a carton to top it up. Mix the juice with boiling water and pour over the puddings. I poured until the sauce reached the lip of the ramekin. I baked the Orange Self Saucing Pudding on 180C/350F/Gas Mark 4 for 25 minutes. 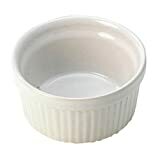 They look a bit like souffles when they come out, but do sink down into the ramekin as they cool. The Orange Self Saucing Pudding was very tasty and had lots of sauce underneath the batter! The orange flavour was just right and although filling, they were very moreish. We ate them with custard although you could have them with cream or ice cream. Recipe slightly adapted from Delicious Everyday. Must give self-saucing puddings a try. Yours look lovely!! I have never made a self-saucing pudding! I do like the sound of an orange one though!!! Agree with your thoughts on the diani debacle, the oldies this series aren't very good at taking critisism / admitting their wrong, though it could just be the way it's been edited. Now there's been a fuss about it / surge in viewings, I'm worried they're going to try and vamp it up / dramatise it more! I hope not as the down -to – earth feel of the show is what makes it awesome. Anyway, I digress, your self saucing puds looks amazing, and I'm drooling at my desk!! You're right they really do have trouble admitting they're wrong! Norman manages to make his over confidence funny though, whereas Diana didn't. I hope the drama calms down too. Glad you like the look of the puddings!